On a Windows Server 2016, the following error may appear when trying to configure Routing and Remote Access: "Installation of the Routing and Remote Access failed because Class not Registered (80040154)". Problem in Details: After Installing the "Remote Access" role in order to add the "Direct Access and VPN" features on Server 2016, you get the error "Installation of Routing and Remote Access failed because Class not Registered. (80040154)" at the final step of "Routing and Remote Access Setup Wizard". Cause of the "Class not Registered (80040154)" error: The error occurs because the installation of "Remote Access" role was not successful on the server. 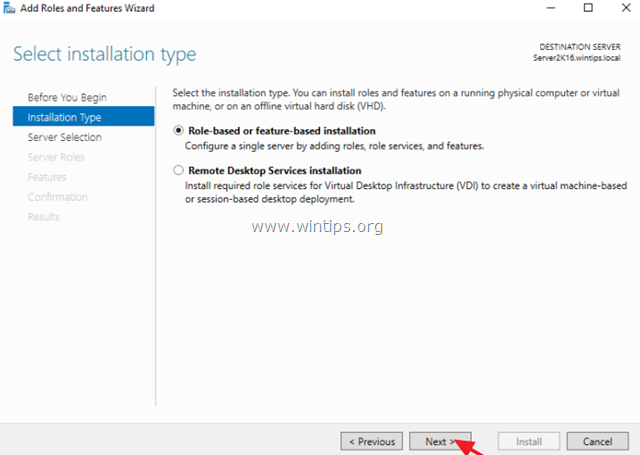 How to fix FIX: Class not Registered (80040154) in Routing and Remote Access Setup (Server 2016). 1. Open 'Server Manager' and click on Add Roles and Features. 2. At the first screen of 'Add Roles and Features wizard' leave the Role-based or feature-based installation option and click Next. 3. At the next screen, leave the default option "Select server from the server pool" and click Next. 4. Select the Remote Access role and click Next. 5. At 'Features' screen, leave the default settings and click Next. 6. At 'Remote Access' information screen, click Next. 7. At 'Remote Services' choose the Direct Access and VPN (RAS) role services and then click Next. 8. Then click Add Features. 10. Leave the default settings and click Next (twice) at 'Web Server Role (IIS)' and 'Role Services' screens. 11. At 'Confirmation' screen select Restart the destination server automatically (if required) and click Install. 12. Now wait until the installation is completed. * Note: If, at the end of the installation process, the Feature Installation failed with the error: "The request to add or remove features on the specified server failed. The operation cannot be completed, because the server that you specified requires a restart", then read this tutorial to fix the problem. 14. Proceed and configure Routing and Remote Access.